As unfortunate as it is, a bet on football can be won or lost on a call from the officials, and NFL handicappers will need factor in the referee for Super Bowl LIII before wagering on the game. On Tuesday, the National Football League sent out an official press release announcing the officiating crew for Super Bowl LIII and veteran John Parry will be the referee overseeing the matchup. After the games on Sunday, when the Los Angeles Rams take on the New Orleans Saints in the NFC Championship and the New England Patriots play the Kansas City Chiefs in the AFC Championship, we’ll know for certain which two teams will meet in the Super Bowl. To help bettors prep ahead of time, we took each of the four remaining playoffs teams and used Pro Football Reference to see what each team’s win-loss record is when Parry officiates their game since the beginning his career in 2000. We’ve included the overall record and the 2018 results in parenthesis. If the Rams win this Sunday, then they look to be a lock to win the Super Bowl since they have never lost when Parry officiates and are 2-0 this season alone. The Patriots also have a favorable record with him as well despite a loss in the only game he called for them this year, and his officiating seems negligible when on the field with the Saints. Chiefs fans may want to avoid the next section to not witness what the Cowboys fans suffered through last weekend. Parry, who is in his 12th season as a referee and 18th season as an official, never really made headlines during the 2018 NFL regular season and the general consensus is that he had a good season, but that all changed this past Saturday. Late in the first half of the Cowboys-Rams divisional playoff game, which saw the Cowboys driving the ball while down 20-7 and in Rams territory, quarterback Dak Prescott started to scramble and was grabbed from behind. The play was blown dead by Parry, who said the quarterback was “in the grasp” of the defender. This awarded the Rams with a sack, effectively ending the Cowboys chance of putting points on the board before halftime. The only problem? It was Prescott’s own teammate, offensive tackle La’el Collins—not a defender—who grabbed the quarterback. Don’t believe us? See for yourself. Seeing that drive come away with no points was a especially heartbreaking for people who bet on the Cowboys point spread (+7) for the game since they would go on to lose 30-22 to the Rams and not cover. This year’s Super Bowl will be the third time Parry has served as an official in the big game and his second as a referee. He won’t be officiating the 2019 AFC or NFC Conference Championships. 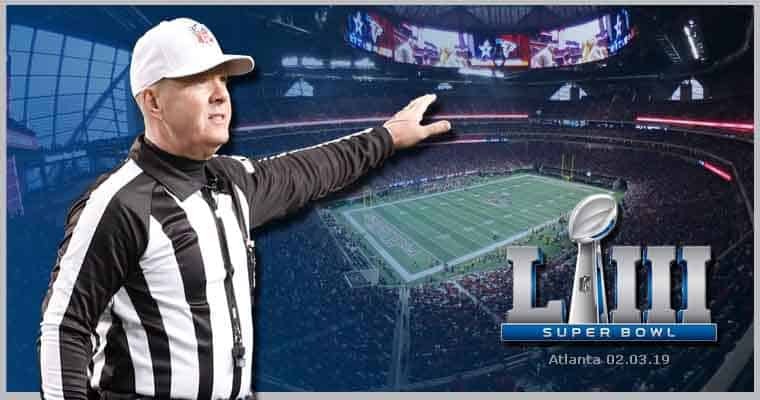 The rest of the Super Bowl LIII officiating crew includes umpire Fred Bryan, down judge Edgar Camp, line judge Jeff Bergman, field judge Steve Zimmer, side judge Eugene Hall, and back judge Terrance Miles. Officials Bryan, Camp, and Hall will be calling their first Super Bowls. Super Bowl LIII kicks off at 6:30 p.m. ET on February 3, 2019, and will be televised by CBS.